During the months of July and August, public attention in Israel and worldwide was naturally focused on the war in Gaza, as did media coverage. Far from the public eye, Israeli authorities continued to abuse the rights of asylum-seekers and exhibit systematic failures in addressing the refugees’ basic needs. The discrimination against this population made them more vulnerable than most Israelis and left them without adequate protection. The Hotline for Refugees and Migrants collected the most important developments that occurred during the Gaza war that concerned the population of African asylum-seekers in Israel. At the end of June, asylum-seekers marched from the Holot detention facility to the Egyptian border to protest against their indefinite detention without trial. Israeli soldiers prevented the marchers from reaching the border with Egypt, and the asylum-seekers decided the open a protest encampment near the border and refused to return to Holot, calling on the international community and the UNHCR to rescue them. 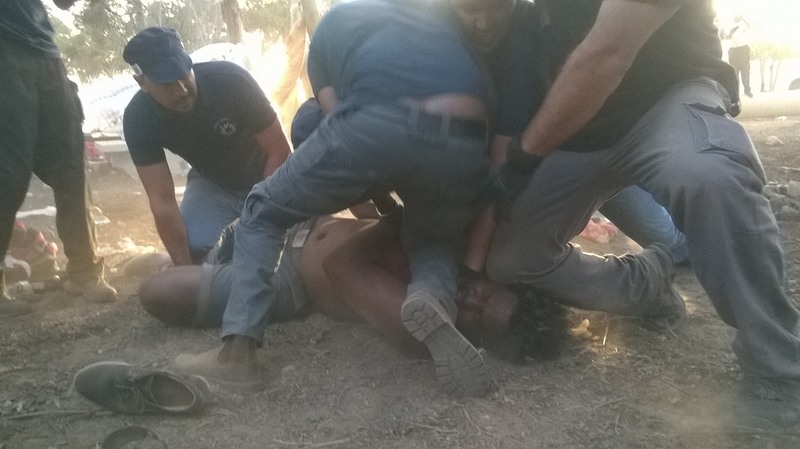 After they’ve spent two days in the camp, Immigration Authority inspectors and Israeli Police Special Patrol Unit (Yasam) arrested the asylum-seekers who took part in the march, using excessive force. Following the violence dispersal, dozens of refugees required medical treatment and a few of the asylum-seekers were hospitalized. 756 protesters were transferred to Saharonim immigration prison as punishment for leaving the Holot detention facility and not attending the three daily roll-calls mandated under the Anti-Infiltration Law. According to the Anti-Infiltration Law, Article 32B(D), a person must not be jailed for violating the rules of the Holot facility without first being able to present his claims to authorities. “The Border Control Officer will not give a [detention] writ to the resident [detainee in Holot]… unless he gave him the opportunity to present his claims before it; if the resident [Holot detainee] or infiltrator [asylum-seeker] cannot be located, the Border Control Officer may give the [detention] writ in absentia, as long as he can voice his claims no later than 24 hours after being transferred to custody [in immigration prison].” Although the asylum-seekers were easily located, they were not given the opportunity to present their claims before being violently arrested. Even after 24 hours, authorities did not have the legal right to hold many of the asylum-seekers, as for the first time in the history of the Saharonim prison, authorities had to deal with 756 new detainees who arrived at once to the prison. Testimonies collected by the Hotline for Refugees and Migrants indicate the detainees held in Ward 7 in Saharonim prison did not undergo a hearing, and over 24 hours after being arrested, at least 70 asylum-seekers detained in that ward were yet to undergo a hearing. The hearings are held before a Ministry of Interior clerk, not a jurist, who decided the length of punitive imprisonment in Saharonim. The next day, July 1, 48 hours since the arrest, we received reports indicating that at least 20 people haven’t undergone hearings yet. Several of the asylum-seekers went through the hearings only on Sunday, a week after being arrested. Testimonies collected by the Hotline indicate that the hearings were carried out very hurriedly and improperly: “They asked us ‘why didn’t you sign [during the three daily roll-calls]?’ and then informed us that we’ll stay either three or six months in Saharonim,” reported Tesfay, an asylum-seeker from Eritrea. “They didn’t let us add anything or even say anything. Everything was very rushed and done very very quickly in just a few minutes.” Therefore, according to the testimonies, even when the hearings were finally held, they were not conducted according to the law, as the detainees were not given an opportunity to voice their claims. Starting December 2013, the Ministry of Interior (MoI) greatly reduced the number of offices providing services to asylum-seekers. Asylum-seekers in Israel are subject to a non-removal policy and receive a 2A5 visa that needs to be renewed every one to four months (the length of the visa is arbitrary, designed to make asylum-seekers feel uncertain and anxious about their future in Israel). Following this cutback, the number of MoI offices servicing asylum-seekers was reduced from 24 to just three and later expanded to six. 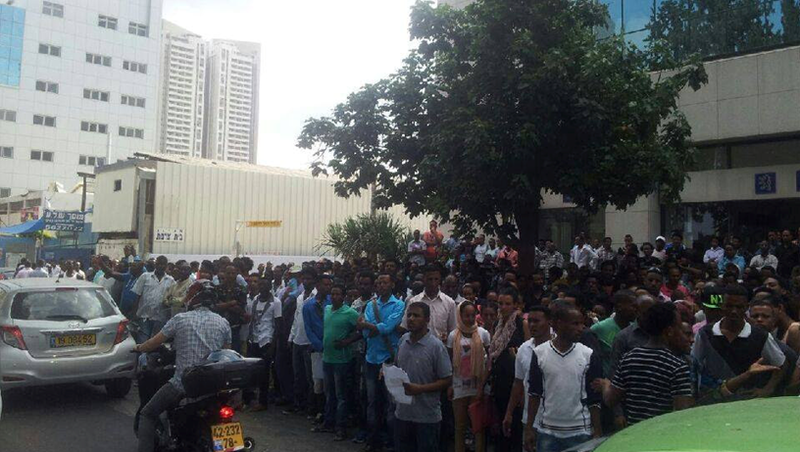 This immediately led to week-long queues outside the offices and most asylum-seekers were unable to renew their visas on time, and thus lost their jobs and could be detained at any moment. Following repeated requests to the Ministry of Interior by the Hotline and fellow human rights groups and media coverage, the number of available offices was increased to seven (Tel Aviv, Rishon LeZion, Nazareth Illit, Hadera, Beer Sheva and Eilat) and the hours of reception in the Tel Aviv office were extended. However, during the month of July, the MoI once again greatly reduced services to asylum-seekers, leading to long lines and effectively denying services to many. Asylum seekers now have to wait in line for hours and even days and risk losing their jobs or being detained for not holding a valid visa. 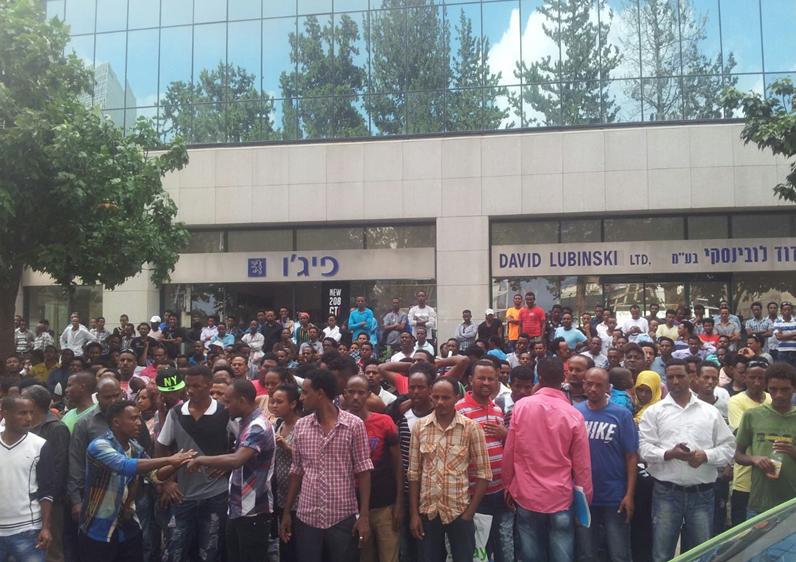 The Beer Sheva office was closed due to rocket fire, but even prior to that, the offices in Petah Tikva, Rishon LeZion and Nazareth Illit began denying service to asylum-seekers. Asylum-seekers throughout Israel were at a loss during the war and did not know how to act when the air raid sirens went off since the instructions of the Home Front Command and local government never reached them or were not written in a language they understand. “Most people in the community simply don’t know what to do during sirens. They don’t know Hebrew, don’t understand the news and really don’t have an idea about what’s happening,” reported Gabriel, an asylum-seekers from Eritrea who lives in southern Tel Aviv. The lack of access to information also caused panic among detainees in Saharonim prison in southern Israel when the detainees heard the echoes of the bombardment of Gaza by Israel and thought that Israel was bombing them. “We were very afraid and didn’t understand what’s happening. Nobody explained it to us. I was sure that Israel decided to bomb the places where refugees are detained,” reported Anwar, a survivor of the Darfur genocide who was detained in Saharonim at the time as punishment for organizing a protest against the indefinite detention of asylum-seekers in Holot. Saharonim prison itself is not adapted to such emergencies, and when the sirens would go off, the guards ordered the detainees to get into their rooms, which are not protected at all and have windows that upon explosion become dangerous shards. It should be mentioned that as far as we know, the guards in Saharonim prison also don’t have shelters. There are bomb shelters in Holot, but they are usually locked. When the war started, the Hotline received reports from detainees that the shelters remain locked during sirens too. After the Hotline contacted the MoI, the problem was mostly solved. However, the instructions on what to do during sirens that were sounded by the camp’s announcement system were only in Hebrew and English. Since they are not allowed to work, the asylum-seekers detained at the Holot facility receive a NIS 160 stipend every ten days ($134 per month). The detainees use the money to finance their travel for medical treatment or to see their lawyers, and to pay for medicines that are not a part of the list of drugs supplied at the facility and more nutritious or tasty food than what is being served by the Israeli Prison Service. In early August, the Hotline received reports that MoI officials presented a list to the asylum-seekers in the different wards of detainees who committed different infractions. Authorities decided to punish those who committed the infractions by reducing or altogether confiscating the allowance. N., a survivor of the Darfur genocide who is detained in Holot and reads Hebrew very well mentioned to the Hotline that the infractions were not mentioned in the lists provided by the MoI. “Most people don’t know why they’ve been punished,” added N. According to him, only half the detainees in the facility received the entire sum of the allowance and the rest received much less or didn’t receive any of the allowance at all. The testimony of Mutasim Ali, another asylum-seeker from Darfur who is detained in the facility, clearly shows the ability of prison authorities to abuse the vague wording in the law to randomly claim that almost anything is a punishable ‘violation of the order’. Mutasim told the Hotline: “I was on a bench just outside the facility with another friend… Suddenly, the director of the facility came to us and said that we must not sit here because the bench has been moved and it’s not in its right place. I told him that I didn’t move anything and that I didn’t know that, and I added that I don’t have a problem to move elsewhere if we need to. He said that if we can’t say right away who moved the bench – we will be the ones punished for it.” Mutasim told us: “I don’t think the benches were even moved. It’s was just a lie.” The arbitrary nature of the punishments in the facility can be clearly observed in this instance: Mutasim was deprived of NIS 100 ($28) for this “offense”, while the friend who sat on the bench with him and was supposedly an “accomplice” was not punished. It should be mentioned that Mutasim was among the leaders of the general strike of the detainees in Holot in June against their indefinite detention and was recently moved back to Holot after spending a month in Saharonim prison as punishment. Additional testimonies of Holot detainees show that the camp’s authorities have found another way to reduce the asylum-seekers’ allowance. The Ministry of Interior is supposed to approve short vacations (maximum period of 48 hours) to asylum-seekers on special occasions – for example, when they travel, at their expense, to receive medical treatment or meet former employers to get the compensation they deserve. In practice, The MoI grants very few of these vacations after they force asylum-seekers to wait in line outside their office in Holot day after day and then reject most of the requests of the lucky few who are admitted inside. Now, sums are deducted from the allowance for the period of time the detainees were outside the facility. “I traveled to Tel Aviv a month ago to meet my lawyer about my salary [at a former employer]. I had an exit permit for 12 hours,” reported Tsagay, an asylum-seeker from Eritrea. “I returned on time and they deducted NIS 16 for nothing. I showed him that I have the permit and they told me ‘it doesn’t matter, you weren’t here.’ This happens to many people here now and those who leave for a longer period of time get a higher deduction.” Even if we follow the ‘logic’ of the MoI, the sum detainees receive for 12 hours inside the facility is NIS 8 (160/20), not NIS 16.